Imagine being able to see your unborn baby’s milestones as easy as telling the time…now you can! When I was pregnant I read the What to Expect When Expecting Book. In fact, it still sits on my bookshelf and my youngest child is 4. During my pregnancy I would flip through the pages to learn more about what is happening to my body and my baby’s development. Pregnancy was exciting and I was blessed to experience it five times. Today’s expectant mothers can now track their baby’s development and their pregnancy stages with the Apple Watch. I sure wish they had this technology when I was expecting! Everyday Health, Inc. announced the launch of the What to Expect Pregnancy Clock Apple Watch™ app. The What to Expect Pregnancy Clock delivers a pregnancy countdown (to the second) – with weekly updates and visual growth milestones to track progress, actionable tips and notifications synchronized to the baby’s growth and development, and other relevant pregnancy information on demand. All of this gives expectant parents-to-be convenient, personalized, and discreet access to essential information about their baby’s development. Everyday Health, Inc. is a leading digital health and wellness company that operates the digital assets of What to Expect, Heidi Murkoff’s world-renowned pregnancy and parenting brand. 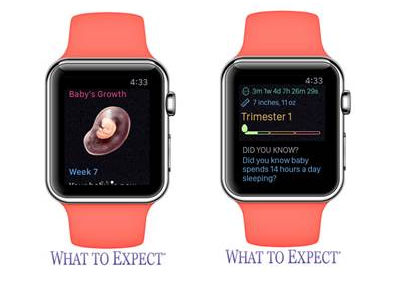 For more information about What to Expect and the Pregnancy Clock Apple Watch App visit: whattoexpect.com. Baltimore riots Mom : Hero or Did She go Too Far?